The cape is fall’s newest jacket silhouette and so retro chic. It begs to be worn with tailored pants, a chunky-heeled shoe, and dark oversized sunglasses. Jackie O style. 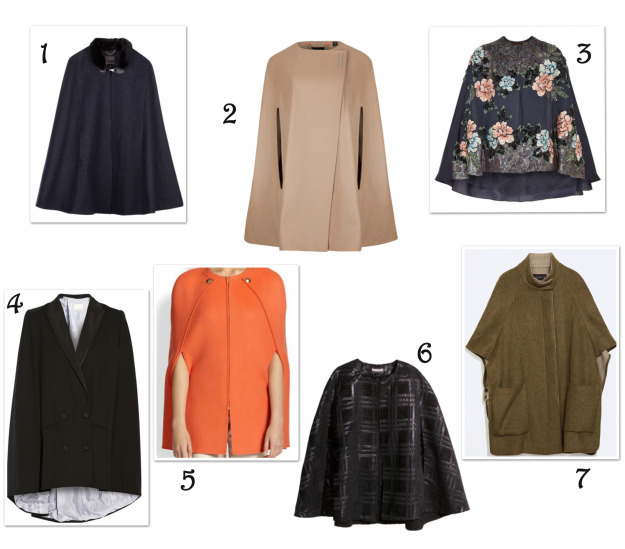 Capes can be on the voluminous side, so keep the rest of your ensemble slimming vs. full to balance the look. For instance, slim pants or leggings and pencil skirts are a good choice, wide-leg trousers not so much, unless your cape is shorter with a more tailored look. And no midi-skirts. If you are petite, stick to shorter capes, as the longer ones would be overwhelming on your frame, and wear heels. A bonus to wearing a cape – besides the looks of admiration you will get for being a ultra-stylish risk taker – is that your clothing underneath doesn’t get as wrinkled!